round of pool play then competed in the Gold Bracket and took first place. See a photogallery from the State BB Tournament in our Photos Section! Cick on the Photos link at the top of the page to see a huge photogallery from the 2018 state basketball tournament. Read more about See a photogallery from the State BB Tournament in our Photos Section! The season is officially over but basketball honors keep rolling in. The 2017-2018 district 12C all-conference team selections and all-state selections are stacked with Madison County athletes. 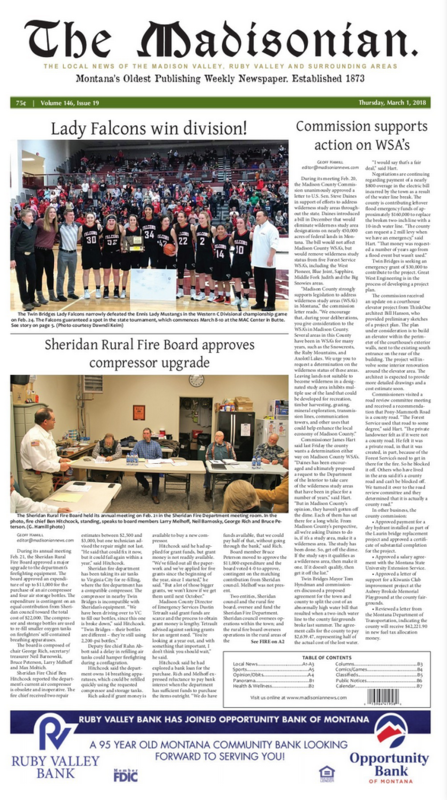 HAMILTON – Both Twin Bridges Falcon teams and the Ennis Lady Mustangs were in Hamilton last weekend for the western C divisional tournament and a bid at the state tournament. The Lady Falcons came out on top, edging the Lady Mustangs out of the title game by two points, 37-35. Lady Falcon standouts Kailee Oliverson and RaeAnne Bendon led TB in a dominating first-round performance against a young Lady Wildcat squad. Lead scorers: TB: Oliverson, 16; Bendon, 14; Guinnane, 5. Harrison: Bacon, 2; Makenna Christiansen, 2; Maddie Christiansen, 2. BUTTE – Winter weather could not deter either Falcon team on Feb. 17 as they ran away with two district 12C championship titles. The Lady Falcons defeated the Ennis Mustangs, 51-36, and the Falcon boys’ team defeated the Drummond Trojans, 45-33. TWIN BRIDGES -- Twin Bridges juniors Daniel Kruer and Clay Wolfe combined for 34 points when the Falcons hosted the Harrision/Willow Creek Panthers on Feb 9. Kruer led all scorers with19 points, while Wolfe sank 15 in a 70-45 late-season win for the Falcons. Madison County athletes had one final chance last week to move up in district standings before heading to the 12C District Tournament in Butte, Feb. 15-17. The Twin Bridges Lady Falcons and Harrison/Willow Creek Lady Wildcats will open the tournament on Thursday at 11 a.m. at the MAC Center.